As part of their Year of No Flying, Barnali Ghosh and Anirvan Chatterjee took a wide variety of walking tours. During the course of their year-long project they experienced everything from a tour of Old Dhaka in Bangladesh to an 8-hour trek through Rome. Navigating their way around Rome by walking through gypsy settlements, farms, and a construction site helped lay the foundation for their current project: Berkeley’s South Asian Radical History Tour . As Ghosh recalls, the “walking tour we took in Rome was important for our thinking.” The tour was predominantly in Italian, and not catered to tourists. “Sometimes people don’t really know the places they live in,” she says. The tour weaves stories in and out of the architectural places and spaces of Berkeley. Along the way, the tour unearths a new way of seeing Berkeley’s past through a series of radical South Asians. Though the tour began a little over a year ago, they have given about 35 tours to a total of over 500 people. While Ghosh and Chatterjee’s families both have roots in Kolkata, Ghosh grew up in Southern India and Chatterjee was raised in the suburbs of San Francisco. In part, the South Asian Radical History tour was inspired by a radical history walking tour of New York. The aim is to avoid the typecast of Indian food and Bollywood. Ghosh points out the importance of dismantling the model minority stereotype, saying, “We are doing our part in balancing out what the perception of our community is, both internal and external.” Some people forget India’s radical history as a country that won its independence from the British, Chatterjee notes, but “we are revolutionary.” Both Chatterjee and Ghosh find shattering the model minority myths an important aspect. For Chatterjee, the story that moves him “on a gut level” is the final story of the tour. A narrative about how Pakistani and Indian students at Berkeley high school dealt with the wave of violence after 9/11. “When these students were going to school they were taunted and called terrorists. One girl was beaten up,” Chatterjee says. Yet they did not stop going to school, “What really inspired me was the way that these youth organized and built alliances and solidarities.” The students organized a series of anti-hate teach-ins, “I don’t know if I would have been able to do that if I was 16 or 17,” Chatterjee says. The tour’s proceeds go to local radical South Asian organizations. Much of the funds go towards the Bay Area Solidarity Summer, a 5-day political action camp for progressive South Asian Youth . Ghosh and Chatterjee look forward to seeing similar tours across the country. They don’t plan on stopping anytime soon. “I see us doing this for a long time. As long as people keep coming,” says Ghosh. Sound intriguing? 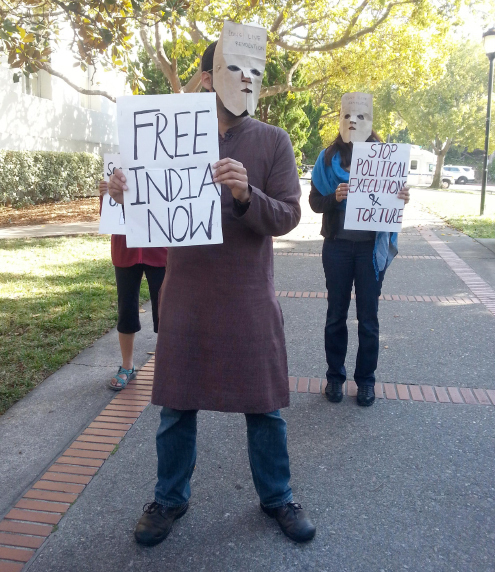 Sign up to take the Berkeley South Asian Radical History Walking Tour and experience for yourself the counter-narratives to be told on the streets of Berkeley, California.